After you visit a website, your browser will 'save' pieces of it. Because your browser can display the files stored in its cache much faster than it can pull fresh files from a server, the next time you visit that site, the use of cached files will help cut down page load time. >If your system stops responding, you experience slow file server while you are reviewing documents in Lexbe eDiscovery Platform even though you have good internet speed. > Free up space on your computer: After a while, the cache fills up and needs to be cleared -- at least once a quarter -- so your Web browser will function most efficiently. > Protect your privacy: At work, you may not want others to see where you have browsed, while at home, several people may use the same computer. If you have privacy concerns, you'll want to regularly clear your cache. Make sure you have the latest version of IE9, then click the gear icon in the top right. >Go to Tools > Internet Options. 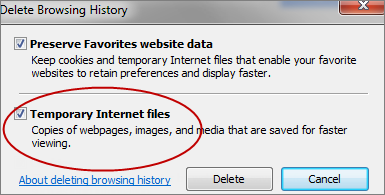 >On the General Tab under Browsing History, select 'Delete Files'. >Go to Tools > Clear Recent History or Clear Private Data. >For 'Time Range to Clear', choose 'Everything'. >Click on the Settings button in the top right of the browser. (It looks like a wrench). >Select only 'Empty the Cache'. >In the drop-down that reads 'Obliterate the following items from select 'the beginning of time'. >Click the 'Clear Browsing Data' button. Once you are done clearing your cache in any browser, refresh the page you are viewing so your browser has a chance to grab the fresh files. If you need additional help or your Web browser is not listed here, search your browser's Help menu for 'clear cache'.